Patients with persistent pain who are educated about ways to manage their pain have been shown to have fewer pain symptoms; enhanced self–efficacy, including communication with physicians; and enhanced pain beliefs. Some researchers have discussed the provision of educational materials and multidisciplinary pain education programs to improve self-efficacy and pain–related outcomes. Brief office-based tools are required to promote self-management of persistent pain. 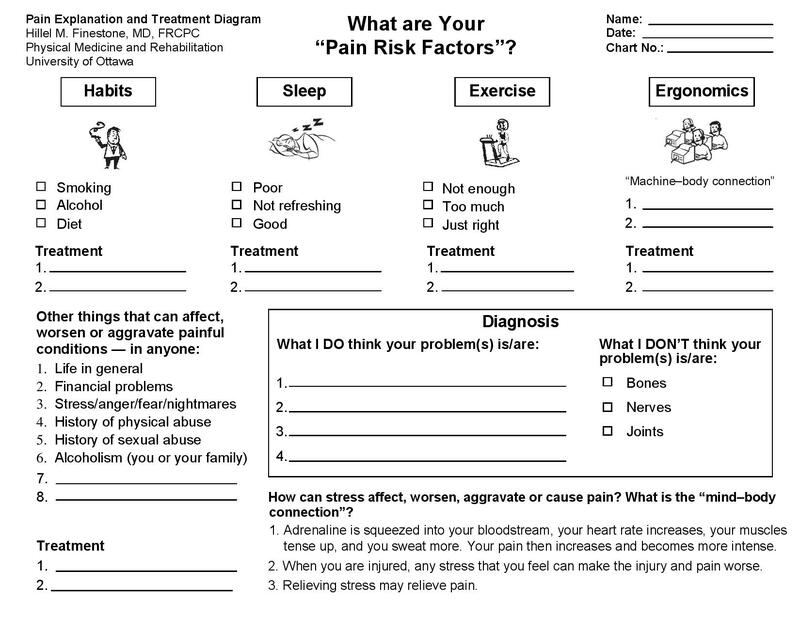 The Pain Explanation and Treatment Diagram (PETD) was designed to enable patients to recall the diagnostic and treatment information provided to them in the outpatient clinic. 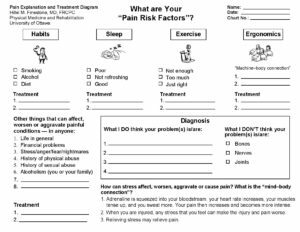 It is a one-page worksheet that identifies risk factors (health-related habits, sleep, exercise, ergonomics and psychosocial factors) involved in chronic pain. Clinician and patient complete the PETD together, and the clinician notes recommended treatments and lifestyle changes. Patients take it home, review at their leisure and can use it as a communication device with their therapists. In our study, twenty nine patients with chronic musculoskeletal pain completed a telephone interview to examine the effect of use of the PETD on patient recall of diagnostic and treatment information. Participants who referred to the PETD at home recalled significantly more items than those who did not. The authors concluded that the PETD is a promising, feasible and inexpensive tool that can improve patients’ recall of diagnostic- and treatment-related information. It is currently being studied by Ottawa, Ontario academic family medicine health team nurse, Dr. Hillel Finestone MD FRCPC (Physiatry) and others (Dr. Elizabeth Muggah, Family Physician and Dr. Ray Deonandan, Epidemiologist, of the University of Ottawa) to assess whether it enhances patients’ treatment outcomes. The authors anecdotally referred to it as patients “pain passport”.